NEW!!! NOW SHOP SWAG ONLINE!!! Welcome to Lane Silencers and Guns, manufacturers of some of the world's finest and quietest suppressors available – at a price you can also afford. Our innovative designs and manufacturing expertise set our products apart, creating a difference you can easily see and hear. Why Choose a Lane Suppressor? Take apart design – Allows for easier cleaning and possible future upgrades. Customization – We can build to customer needs as ordered (thread sizes, material, core design, etc.). Suppression – From our metering, we have found that we are among the quietest, even against big name companies. Cost per decibel reduction – Our prices are among the lowest on the market. 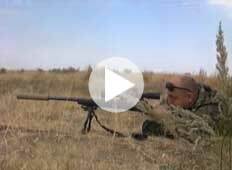 Watch this video of a antelope taken at 640 yards using a Scorpion King suppressed .308. Lane Silencers and Guns • Rapid City, South Dakota 57702 • (605) 791-0740 • © 2012 Lane LLC. All Rights Reserved.